Volume II of our series containing the major stories from the Shahnameh opens and closes with tales of tragic conflict between a king and his son: Prince Seyavash and Prince Esfandiyar are both driven from the court by their foolish fathers to confront destiny and death in distant lands. Interwoven with Seyavash’s story is the tale of his stepmother Sudabeh’s lust for her young stepson, and of his escape from her tricks by the famous trial by fire; Esfandiyar’s story involves the last combat of the great Rostam, a fight to the death which leads to Rostam’s own demise at the hands of his evil brother Shaghad. Between these two stories the reader travels through a wondrous landscape of romance (Bizhan and Manizheh), demons (the Akvan Div), heroic despair (the tale of Forud) and mystical renunciation of the world (Kay Khosrow’s mysterious last journey). This splendid book is the second in a projected set of three volumes that will recount all the major events of the Persian national epic, the Shahnama or Book of Kings. Written in rhyming couplets by the poet Firdawsi and completed in about 1010, the epic runs to more than 40,000 lines. Volume 1, Ehsan Yarshater’s The Lion and the Throne (CH, May’98), was translated by Davis largely from an earlier Persian prose translation. Davis translated the present volume directly from the original text and presents it to the reader as a felicitous mixture of prose and verse. 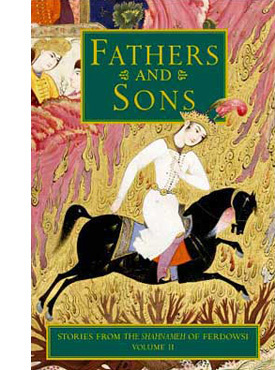 Fathers and Sons begins where volume 1 left off, recounting the epic from the legend of Seyavash to the death of Rostam, bringing to a close the purely legendary part of Shahnama. Davis provides an informative introduction as well as a translation that is a joy to read. This reviewer particularly welcomed an increased amount of verse in this volume. Aimed at a wide and varied audience, not exclusively academic, these volumes appeal to the eye as well as the ear. Like its predecessor, this volume is beautifully produced in every respect. Large academic and general libraries collecting Middle Eastern literature and cultural history. This second volume of stories from the Persian national epic, Book of Kings” (Shahnameh, composed by the poet Ferdowsi between 980 and 1010 C.E.) is so beautifully produced and so exquisitely illustrated with 181 rare color miniature reproductions that it could be used for an art class. The stories themselves are fascination, as illustrated by the adventures of princes Seyavash and Esfandyar, whose respective fathers/kings push them to face the realities of life through extraordianry trials in faraway places. Probably the most famous story here, however, is not laden with violence but romance. It depicts the touching love story of Bizhan and Manizheh, who, like Romeo and Juliet, are the children of sworn enemies. In addition to the seven main sections, the useful introduction by translator Davis (Persian, Ohio State Univ.) gives some background to the Shahnameh and to Persian miniature art. A glossary of manes and their pronunciation as well as a guide to the illustrations providing provenance and other credits conclude the book. Highly recommended for all collections. Garsivaz and Gorui dragged him away from the army and the city to a wasteland on the plain. Gorui took the dagger from Garsivaz, and when they had reached the appointed place they threw the prince’s mammoth body to the ground. Knowing neither fear nor shame, they held a gold dish at his throat to catch the blood and severed the head of that silver cypress tree. The prince’s head sank into endless sleep, never to awake. Gorui took the dish to the place that Afrasyab had ordered, and emptied it. A wind rose up, and darkness obscured the sun and moon; people could not see one another’s faces, and all cursed Gorui. A wretched, broken man whom all despise.